The annual retirement confidence survey from the Employee Benefit Research Institute (EBRI) was released this week and it showed that many Americans are optimistic about their chances of being financially secure in old age. 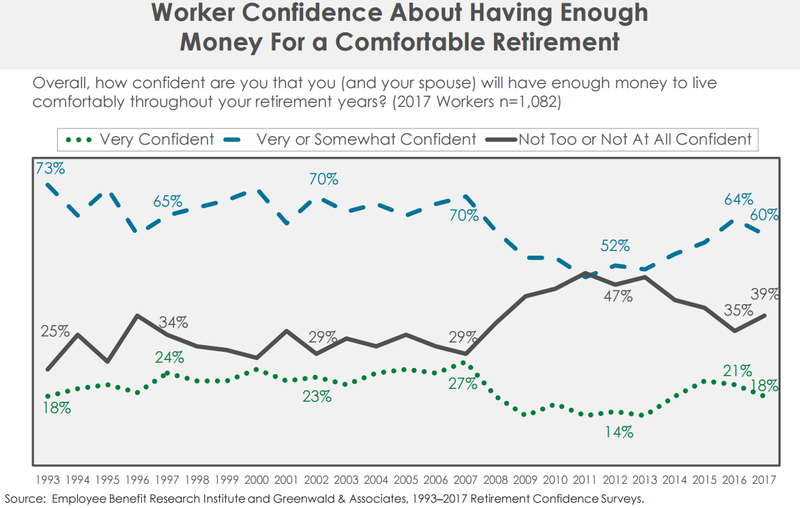 Specifically, 18 percent of surveyed U.S. workers said that they are “very confident” that they will have enough money to retire comfortably, and 42 percent reported that they are at least “somewhat confident.” Further, 61 percent of worker respondents said that they have personally set aside money for retirement (excluding Social Security taxes and employer-provided benefits), and more than half reported that they are very or somewhat confident that they are doing a good job when it comes to preparing financially for retirement. As for current retirees, 79 percent of respondents said that they are very or somewhat confident about being able to maintain a comfortable standard of living in old age. Although some of the above-mentioned figures are down slightly compared to the 2016 survey, workers and retirees are still reporting an overall level of confidence that is much higher than what was seen during the “Great Recession.” Such improvements are a reflection of the significant recovery that occurred in both the economy and the stock market over the past few years. The study also revealed that there is a strong correlation between old-age financial confidence and participation in a workplace retirement plan. 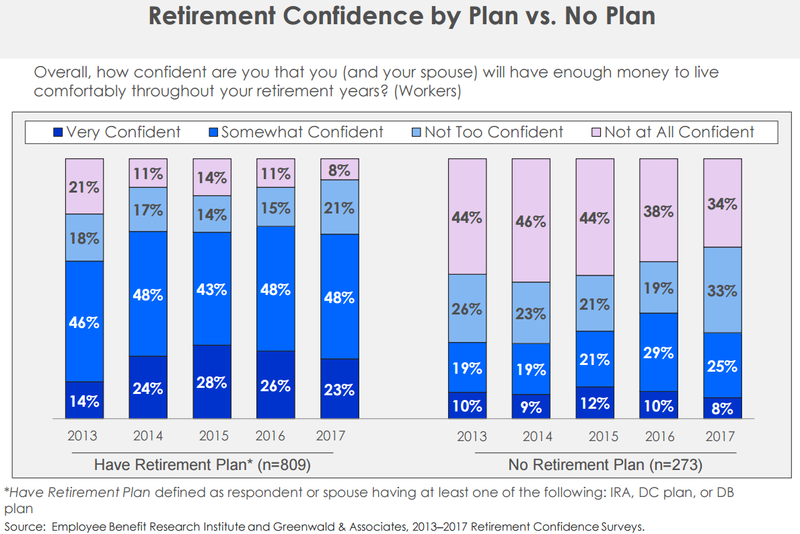 For example, 23 percent of surveyed workers who reported that they or their spouse have money in an employer-provided defined contribution (DC) plan or similar savings vehicle said that they are “very confident” about achieving a comfortable retirement, compared to just 8 percent for workers not currently participating in such a plan. 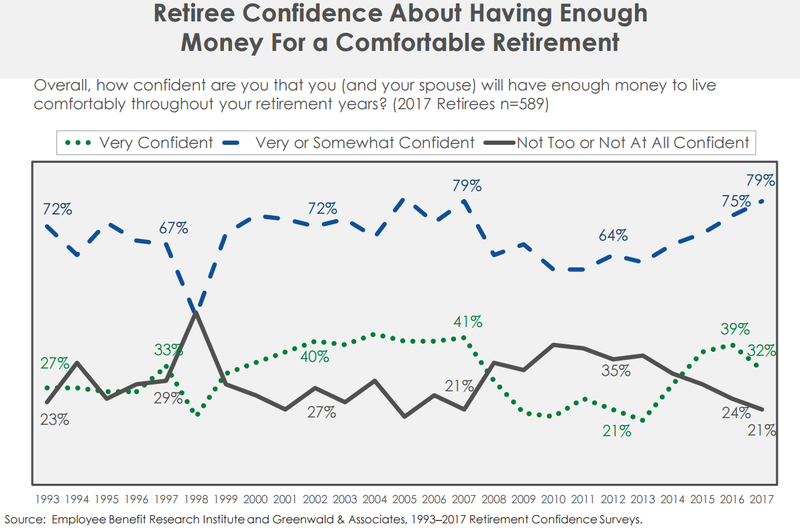 Similarly, surveyed employees without a workplace-provided retirement plan were found to be more than four times as likely to say that they are “not at all confident” about their ability to retire comfortably. Moreover, workers who participate in a retirement plan were ten times more likely to say that they are currently saving for retirement. The study also revealed that much of the increase in overall retirement confidence seen during the past few years has been due to greater optimism among individuals with a workplace retirement plan, not surprising since an improving economy and a tightening labor market mean that more job seekers are able to find employment opportunities that offer these valuable benefits.